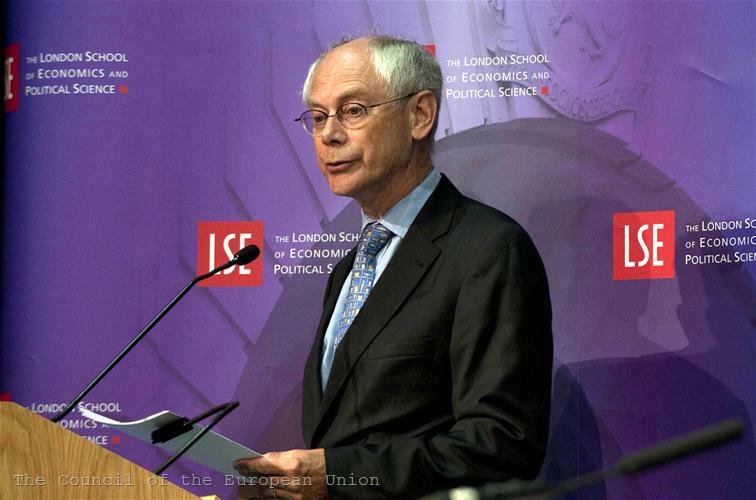 As if to refute the critics who consider him invisible and lacking in personality, European Council President Herman Van Rompuy delivered an impressive speech at the London School of Economics. "Unlike some of the other players, I do not practise 'megaphone diplomacy' via the media. I prefer 'quiet diplomacy'. 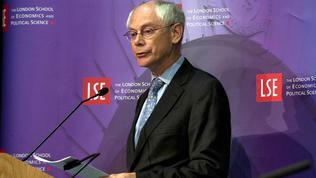 It is more discrete, but also more efficient," Mr Van Rompuy frankly said. He made a comprehensive overview of the crisis that had hit Europe three years ago, defining it as "the biggest economic tsunami since the Great Depression." However, before stopping at the problems, the president of the European Council underlined the difficulties which the EU had successfully addressed. "We avoided protectionism - in no small part thanks to the single European market and the legislation that backs it up. We largely avoided competitive currency devaluations - in no small part thanks to the euro." If the EU still had different national currencies, it would have caused turmoil on the currency markets, would have affected imports and exports and would have shaken if not even destroyed the internal market, said Van Rompuy. "Even now, at the global level, we must take care that exchange rates reflect the economic fundamentals rather than being an element of protectionism," the President added, obviously directing this remark to China, which still controls centrally the value of the yuan (renminbi). 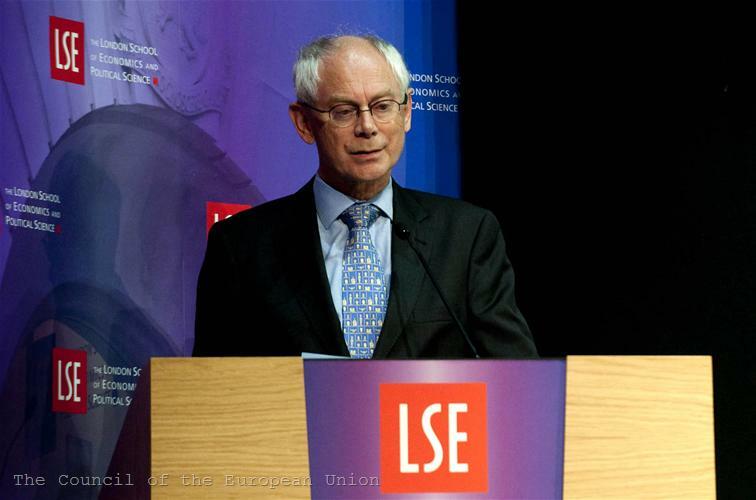 Herman Van Rompuy spoke extensively of the debt crisis and the EU response. Regarding the reasons, he said categorically: "Lack of financial oversight played its role. But clearly, the financial and monetary interdependence had been hugely underestimated. Without the fiscal irresponsibility in some countries, there would never have been a crisis in the eurozone." He recalled something that is often forgotten when the EU is criticised for its slow and timid response to the debt crisis: "When the crisis erupted, we had to start from scratch. There was a complete absence of appropriate instruments. There was even an interdiction to take certain types of action (no bail-out clause). Politically, it was also difficult to act, both in the debtor countries, which had to accept reform programmes with strict conditionality, and in the creditor countries, who guarantee the loans." However, in May 2010 the EU launched “a completely new economic governance framework, including a support mechanism for countries in difficulty,” President Van Rompuy noted, describing this new framework as a combination of institutional, peer and market pressure. Institutional pressure has been increased by improving the Stability and Growth Pact, including the creation of macroeconomic surveillance, which did not exist before (the package of 6 legislative proposals on the EU economic governance). Peer pressure has been reinforced through the so called European semester where member states evaluate each other’s budgetary and economic policies, as well as through the Euro Plus Pact, the President of the European Council noted. To the sceptics who doubt the effectiveness of these measures, he said: "Some fear that governments will water down Commission recommendations, as happened in the past. They forget a new element at play, a major incentive to keep an eye on one's peers: the billions involved in the rescue mechanisms. If, after a Commission warning, ministers for some reason let a colleague off the hook, and if at a later stage the country in question asks for emergency loans their public opinion would want to know: 'How could you let this happen?' Markets, too, would react to such events more speedily than in the past. " While refusing to disclose in detail his proposals for crisis management in the euro area, which will be presented in October, Herman Van Rompuy had no other choice but to mention the idea of a eurozone government. Firstly, because France and Germany, who launched the idea have already offered him to take the post of a head of that government and, secondly, because this is just the tip of the iceberg of шге current policy debates about the future of the eurozone and the European Union. For example, if the euro area had its own government, wouldn't it be completely separated from the other 10 countries and how would this affect their development and the Single Market. "We must keep the link between the 17 of the eurozone and the 27 of the Union. The euro affects the single market, and vice versa. The euro affects the financial sector all over Europe. 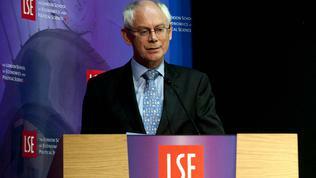 Moreover, many will join the eurozone in the future," Herman Van Rompuy said. As to the other term – fiscal union - that is often used without being explained, Herman Van Rompuy was far more evasive. The term is widely used by analysts and economists with primarily negative connotations - sharing indebtedness, redistribution of wealth from richer to poorer member states, harmonisation of taxes or the introduction of common European taxes. Without expressing his personal attitude, President Van Rompuy preferred to explain what was not a fiscal union, according to him. "’Fiscal union’ does not mean transferring a substantial amount of taxation and spending to the European level. At present, 98% of public spending is national (or sub-national) - only 2% goes through the EU budget. This situation is most unlikely to change drastically, if at all." Fiscal union does not mean to fix common tax rates for everything. But: "We do need more tax coordination, certainly in the field of corporate taxes, knowing that decisions in this field require unanimity." Fiscal union "could mean an increase in transfers from rich to poor member countries. But member states have shown reluctance to increase radically the level of structural funds." In conclusion, the president of the European Council stressed that many of Europe's problems should be addressed at the global level, within the G20: "Domestic concerns hinder a deepening of global cooperation, but all main players have to do their homework: from the American and Japanese debt problem to Chinese inflation and its undervalued exchange rate - both phenomena are linked." However, the EU is ready to do everything necessary "step by step, in the right direction." "We are taking decisions which are often unpopular - in an era of populism," Mr Van Rompuy noted, because "the European Union is too precious an achievement to be put in jeopardy". He concluded his speech by saying: "The political and economic costs of going back are mind-boggling." We cannot doubt his words, because even the biggest sceptics arguing that not the periphery countries are being saved, but their creditors - the banks from the eurozone core, would hardly choose a future without the European Union and without the euro. Nor they could imagine the past without these. We have come too far to give up.